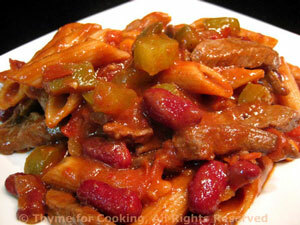 Italian Beef and Pasta, from Thyme for Cooking's Weekly Menu Planner. An easy, skillet dinner with 15 minutes or prep and 25 of cooking. We'll use the rest of the beans from Friday rather than red beans.. Add in onions, tomatoes and a bit of pepper and we have a complete dinner in no time.